India's auto industry body defended domestic manufacturers' safety record on Tuesday, after an international safety watchdog said cars made by Maruti Suzuki and Nissan Motor had failed an independent crash test. The latest clash between India's carmakers and Global New Car Assessment Programme (NCAP) - a consumer safety testing body - comes at a time when the country is preparing to overhaul its car safety rules to reduce road accidents. Watchdog NCAP said this week that Maruti's hatchback Swift and Nissan's compact car Datsun Go showed a high risk of life-threatening injuries to occupants when crashed headlong into a stationary object at 64kmph. NCAP had already rattled the industry by failing five Indian-made cars in January. Maruti Suzuki and Nissan have said they meet the country's current safety standards and will keep up with required changes. "It is just scaremongering," said Vishnu Mathur, director general, Society of Indian Automobile Manufacturers. "Global NCAP can do what they want. We have our own safety road map that we are going to follow and are already following." Mathur said the UK-based agency had not considered that average speeds in India are lower than in the developed world, due to poor road conditions and heavy traffic. India has one of the world's worst road safety records - the result of untrained drivers, inadequate law enforcement, badly maintained roads and unsafe cars. Domestically produced cars are frequently made without air bags or three-point seatbelts to secure children's car seats, as consumers tend to be unwilling to pay up for safety features. About 1.2 million Indians died in car accidents over the past decade, on average one every four minutes, while 5.5 million were seriously injured. To reduce traffic fatalities on roads, India's new government, led by Prime Minister Narendra Modi, is planning to overhaul highway laws - its most ambitious effort since independence in 1947. Part of the government's overhaul is the Bharat New Vehicle Safety Assessment Programme, a ranking system that will include crash tests among other factors before giving cars star ratings. With crash tests expected to become mandatory in India in a few years, it will force car makers to either add air bags in existing models, making them more expensive, or pull cars off the road, said Mathur. 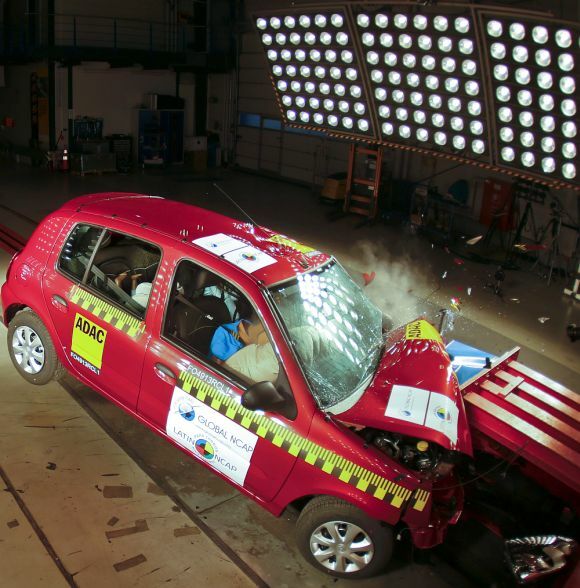 In its report, Global NCAP rated the car structure of the Swift and Datsun Go as 'unstable' saying the latter collapsed when the car was crashed from the front at a speed of 64kmph, the speed at which most fatalities occur. Global NCAP had published car test results for five other best-selling cars in India in January, including models by Maruti, Tata Motors, Hyundai Motor Co, Ford Motor Co and Volkswagen AG.